Marti G. Subrahmanyam is the Charles E. Merrill Professor of Finance, Economics and International Business at NYU Stern, and Global Network Professor of Finance at NYU Shanghai. He holds a degree in mechanical engineering from the Indian Institute of Technology, Madras, and a post-graduate diploma in business administration from the Indian Institute of Management, Ahmedabad. Both institutions conferred on him their Distinguished Alumnus Award. He earned a doctorate in finance and economics from the Massachusetts Institute of Technology. Prof. Subrahmanyam has published numerous articles and books in the areas of corporate finance, capital markets and international finance. He has been a visiting professor at leading academic institutions in Australia, England, France, Germany, India, Italy and Singapore, including ESSEC, INSEAD, the Indian Institute of Technology, Madras, and the Indian Institute of Management, Ahmedabad, Einaudi Institute of Economics and Finance and Università Guido Carli LUISS, in Rome, University of Konstanz, Germany, National University of Singapore, Singapore Management University, Churchill College, Cambridge University, the Paris School of Economics and the University of Melbourne. Prof. Subrahmanyam has served as a consultant to several corporations, industrial groups, and financial institutions in the U.S., Europe, Asia and Latin America. 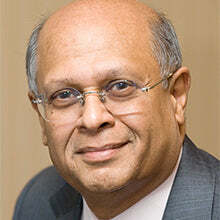 He has served or continues to serve on the boards of several companies, including ICICI Bank Ltd., ICICI Prudential Life Insurance Co. Ltd., Infosys Ltd., Nomura Asset Management Inc., LIC Nomura Mutual Fund Asset Management Co. Ltd., and more. Read his full bio.